[Reiner Schmidt] was tired of renting an expensive 5-axis CNC head for projects, so he decided to build his own. It’s still a work in progress, but he’s made remarkable progress so far. The project is called Bridge Boy, and it is designed to use a cheap DC rotary mill to cut soft materials like plastic, wood and the like. Most of it is 3D printed, and he has released the Autodesk 360 plans that would allow you to start building your own. His initial version uses an Arduino with stepper drivers, and is designed to fit onto the end of a 60mm arm of a standard 3-axis CNC, so technically it’s a 3+2 axis CNC. With the appropriate software, it should be able to work as a full 5-axis machine, though, and it should be possible to integrate it with a CNC that has a 5-axis driver board without too much effort. [Laura Kampf] found a new use for an old Zippo lighter by turning it into a carrier for her screwdriver bits. There are several multitools out there which can accept standard screwdriver bits. The problem is carrying those bits around. Leaving a few bits in your pocket is a recipe for pocket holes and missing bits. [Laura’s] solution uses her old Zippo lighter. All she needs is the case, the lighter element itself can be saved for another project. A block of aluminum is cut and sanded down to a friction fit. Laura uses a band saw and bench sander for this. The aluminum block is then drilled out to fit four bits. Small neodymium magnets are taped into the holes with double-sided tape. These magnets retain the bits, ensuring none will fall out when the lighter is opened. This is a great quick project and an excellent way to carry four bits. We’re curious if the second set of holes (and a shorter bar) could expand this carrier to 8 bits – 4 on top and 4 on the bottom. [Laura] noticed this too, but decided to keep the build simple with 4 bits. We love Every Day Carry (EDC) projects like this – in fact, a few years back we had our own EDC contest featuring the Adafruit Trinket. Check out the awards announcement post for some awesome pocket projects! It’s easy to dismiss decades old electronics as effectively e-waste. With the rapid advancements and plummeting prices of modern technology, most old hardware is little more than a historical curiosity at this point. For example, why would anyone purchase something as esoteric as 1980-era video production equipment in 2018? A cheap burner phone could take better images, and if you’re looking to get video in your projects you’d be better off getting a webcam or a Raspberry Pi camera module. But occasionally the old ways of doing things offer possibilities that modern methods don’t. This fascinating white paper from [David Prutchi] describes in intricate detail how a 1982 JVC KY-1900 professional video camera purchased for $50 on eBay was turned into a polarimetric imager. The end result isn’t perfect, but considering such a device would normally carry a ~$20,000 price tag, it’s good enough that anyone looking to explore the concept of polarized video should probably get ready to open eBay in a new tab. Likely many readers are not familiar with polarimetric imagers, it’s not exactly the kind of thing they carry at Best Buy. 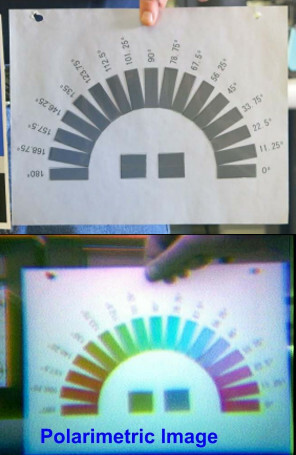 Put simply, it’s a device that allows the user to visualize the polarization of light in a given scene. [David] is interested in the technology as, among other things, it can be used to detect man-made materials against a natural backdrop; offering a potential method for detecting mines and other hidden explosives. He presented a fascinating talk on the subject at the 2015 Hackaday SuperConference, and DOLpi, his attempt at building a low-cost polarimetric imager with the Raspberry Pi, got him a fifth place win in that year’s Hackaday Prize. While he got good results with his Raspberry Pi solution, it took several seconds to generate a single frame of the image. To be practical, it needed to be much faster. [David] found his solution in an unlikely place, the design of 1980’s portable video cameras. These cameras made use of a dichroic beamsplitter to separate incoming light into red, blue, and green images; and in turn, each color image was fed into a dedicated sensor by way of mirrors. By replacing the beamsplitter assembly with a new 3D printed version that integrates polarization filters, each sensor now receives an image that corresponds to 0, 45, and 90 degrees polarization. With the modification complete, the camera now generates real-time video that shows the angle of polarization as false color. [David] notes that the color reproduction and resolution is quite poor due to the nature of 30+ year old video technology, but that overall it’s a fair trade-off for running at 30 frames per second. In another recent project, [David] found a way to hack optics onto a consumer-level thermal imaging camera. It’s becoming abundantly clear that he’s not a big fan of leaving hardware in an unmodified state. Take apart a few old DVD drives, stitch them together with cable ties, add a pen and paper, and you’ve got a simple CNC plotter. They’re quick and easy projects that are fun, but they do tend to be a little on the “plug and chug” side. 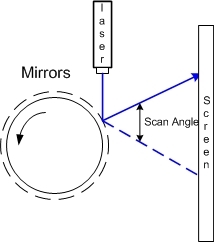 But a CNC plotter that uses polar coordinates? That takes a little more effort. The vast majority of CNC projects, from simple two-axis plotters to big CNC routers, all tend to use Cartesian coordinate systems, where points on a plane are described by their distances from an origin point on two perpendicular axes. Everything is nice and square, measurements are straightforward, and the math is easy. [davidatfsg] decided to level up his CNC plotter a bit by choosing a polar coordinate system, with points described as a vector extending a certain distance from the origin at a specified angle. Most of the plotter is built from FischerTechnik parts, with a single linear axis intersecting the center point of a rotary drawing platform. Standard G-code is translated to polar coordinates by a Java applet before being sent to a custom Arduino controller to execute the moves. Check out the video below; it’s pretty mesmerizing to watch, and we can’t help but wonder how a polar 3D-printer would work out. Have polar coordinates got you stumped? It can be a bit of an adjustment from Cartesian space for sure. It can be worth it, though, showing up in everything from cable plotters to POV fidget spinners and even to color space models. This is the last weekend to get in on the Open Hardware Design Challenge, the first challenge of the 2018 Hackaday Prize. We’re looking for the boldest idea you can come up with. We want to see the beginnings of the next great bit of Open Hardware, and this is your chance to do it. The Hackaday community has thrown itself into The Hackaday Prize and so far we have more than five hundred entries in the running to Build Hope and become the next great piece of Open Hardware. Next week, we’ll choose the top twenty projects to advance to the finals. Each of those twenty project will be awarded $1,000 and be in the running to win the Grand Prize of $50,000 and four other top cash prizes. You still have time. This challenge doesn’t require a specific prototype — it’s all about great design. Demonstrate an uplifting use of technology and show a plan to build it. When you make it into the finals, you’ll have all summer to fabricate and refine your vision. This is your chance to be a hardware hero, so start your entry now.